After spending a few hours watching cooking shows while snowed in last week, I knew it would only be a matter of time until I attached myself to my oven. I mean, you can’t watch delicious baked goods being prepared all afternoon and not have a serious craving for some. And because our home is a mostly-healthy-food-only zone, I knew if I wanted something buttery and sugary? Well, I’d have to make it myself. In one of my weaker moments, I’d printed a recipe for Fifteen Spatulas’ crazy good peanut butter M&M cookies — but lacked the crucial candy component. I decided to just bake the cookies themselves because OMG peanut butter and ignore the candy completely . . . and then I remembered the Heath toffee pieces hiding in the pantry. If you like peanut butter (yes) and love cookies (double yes), these are the treat for you. I had to distract myself to avoid getting seconds or thirds after they came out of the oven, especially because we were sequestered in our tiny apartment where everything smelled like cookies. My final version looked nothing like Joanne’s beauties, and . . . I’m not sure why. Maybe because I made them too large? And they spread too thin, getting extra crunchy? I don’t know. But regardless of appearances, they were delicious. And that’s all that really matters, right? In a medium bowl, whisk together the flour, baking soda, baking powder and sea salt. Set aside. Place the butter, sugar and brown sugar in a large bowl and cream together with a hand mixer for approximately two minutes, until the mixture looks fluffy. Add the peanut butter and egg, mixing until incorporated. Add in the dry ingredients and mix until the flour has almost disappeared. Fold in the Heath toffee pieces, if using, with a spatula. Using a large cookie scoop, portion out mounds of the cookie dough on your prepared baking sheet, leaving 2 inches between each cookie. Bake for 15-17 minutes, until cookies are golden brown. Cool and dig in! Sometimes you want a cookie without all the fuss. Searching for something quick and easy to bake last weekend, I stumbled upon this recipe for chocolate fudge cookies. They’re made using a box cake mix, of all things (gasp! 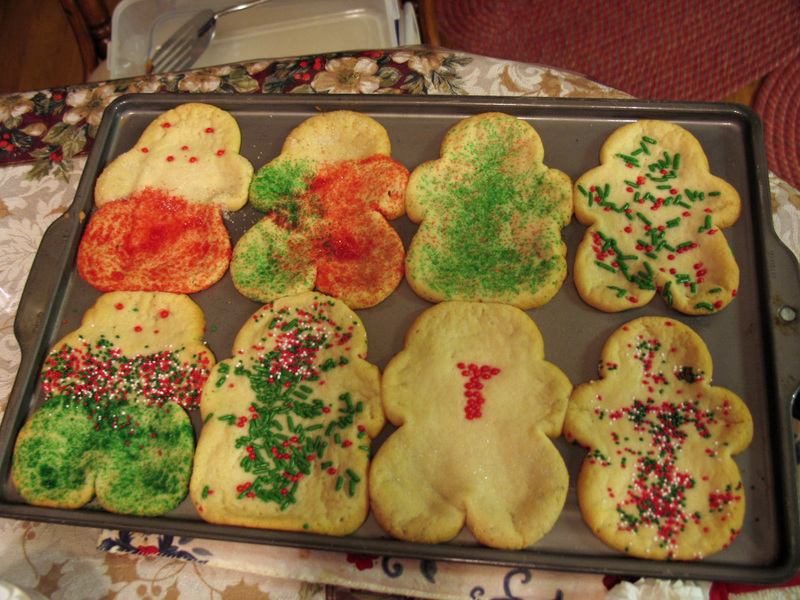 ), but they turned out absolutely delicious — and can be customized in all sorts of ways. Had I had a bag of those addictive mint chocolate chips on hand, I would have happily tossed them in — but this recipe is pretty great as-is! I just added a little vanilla extract to the batter because vanilla makes everything better; it’s science. If you want a quick treat using items likely already in your pantry, I present you with . . .
1. Preheat oven to 350 degrees F (175 degrees C). Grease or line cookie sheets. 2. In a medium bowl, stir together the cake mix, eggs and oil until well blended. Fold in the chocolate chips. Roll the dough into walnut sized balls. Place the cookies 2 inches apart on the cookie sheet. 3. Bake for 10 to 12 minutes in the preheated oven. Allow cookies to cool on baking sheet for 5 minutes before removing to a wire rack to cool completely. Yields approximately 24-30 cookies. I’m linking up with Beth Fish Reads’ Weekend Cooking feature, a great way to check out new blogs and fabulous recipes. Be sure to stop by for more mouth-watering posts beginning Saturday. 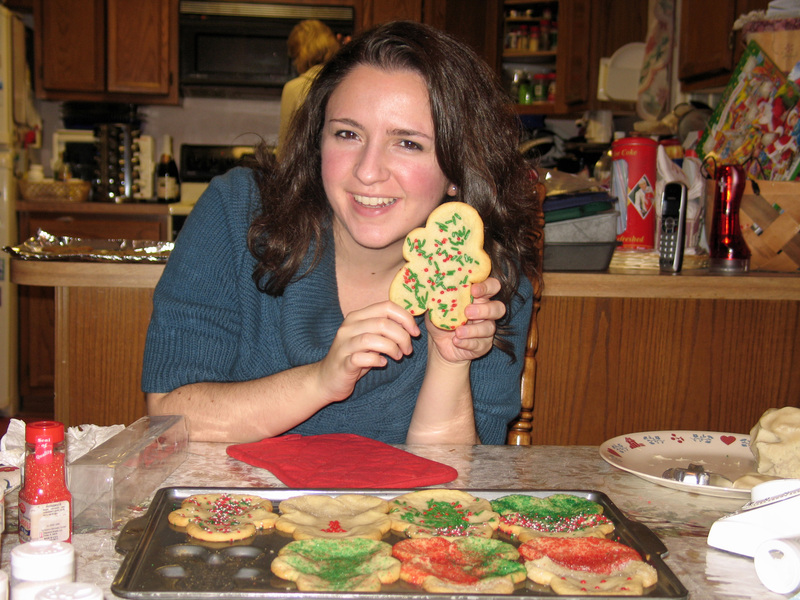 The search for the perfect holiday cookie recipe begins early in our house. As I’m obsessed with all things dessert (I mean, who isn’t? ), whiling away the hours looking at pretty food-related pictures on Pinterest isn’t exactly an inconvenience for me. 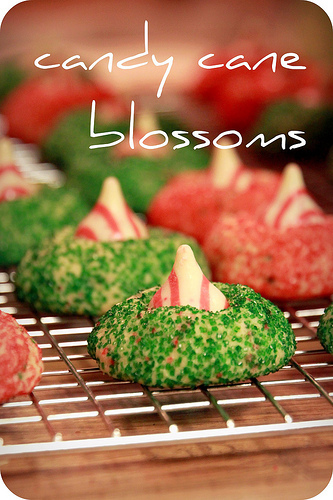 And that’s where I found the recipe for my big baking contribution this year: for Candy Cane Blossoms. These sparkly little beauties came by way of Baked Perfection and seemed like the perfect batch for this time of year. Plus, they look like Peanut Butter Blossoms — possibly my favorite cookie ever. The taste is totally different, though. 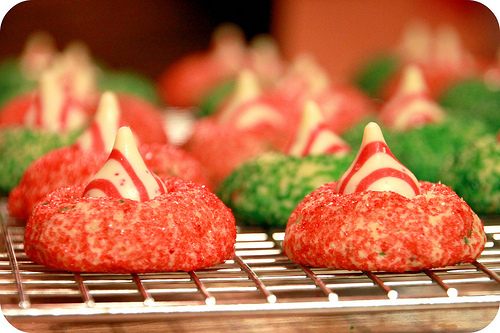 These are a sugar cookie rolled generously in red and/or green sugar (or both), then topped with a peppermint-flavored Hershey Kiss. Those can be a bit tricky to find, I’ll admit, so I stocked up at Target and wound up with quite a few extras. Not that that’s a problem or anything. My sister, Spencer and I spent a few hours in the kitchen Saturday getting these ready for our annual cookie exchange at my aunt’s house. 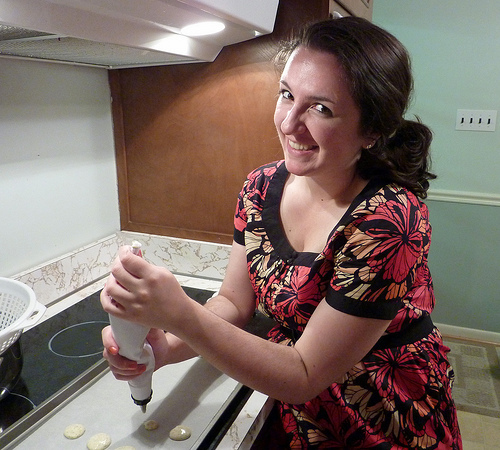 Katie made butterscotch scotchies, a bar cookie, and I had a hard time keeping my grubby mitts off those, too. Desserts don’t last long around our house. Shape dough into 1 inch balls (keep them small!). Roll in red and/or green colored sugar. Place on ungreased cookie sheet. Bake 9-11 minutes or until edges are lightly browned and cookies are set. Remove from oven; cool 3 to 4 minutes. Press candy piece into center of each cookie. Remove from cookie sheet to wire rack. Cool completely. Yields approximately 35 cookies. After bragging about my well-stocked kitchen on Twitter, I settled in to bake Spicy Lemon Butter Cookies — a long-standing recipe in my “to be baked” folder — only to discover . . . well, my pantry was stocked. Until I used up all my ingredients. Gone were two staples of any baker’s repertoire: nutmeg and vanilla extract. Vanilla extract. I mean, seriously? We’re out of vanilla? Rookie mistake to not check and see if we had vanilla. I was cocky, friends, and I’ll admit it: I was wrong. Still, I was in the mood to bake. So I improvised. The vanilla became almond, my most favorite of all flavors; and the nutmeg became extra cinnamon, which I added generously. If I’d been on my A-game, I would have thought to substitute cardamom — the most exotic of all spices in my pantry. But I wasn’t. I was flustered. They were still delicious. Light, fluffy, and with a very distinct almond taste (and aroma!) I love. I could definitely see these at a summer or spring party, and I’m sure they’d be pretty if you didn’t make them as large as I did! Abide by the 1-inch-size cookie ball rule, friends. Abide. They spread. Beat butter, sugar, salt, egg, almond, cinnamon and lemon zest in large bowl with electric mixer on medium speed until light and fluffy. Gradually beat in flour on low-speed until well mixed. Refrigerate 1 hour. Alternatively, you can shape the dough into a log and wrap in a parchment paper before putting in the fridge. Preheat oven to 350°F. Shape dough into 1-inch balls or, in case you have made a log, slice the dough. Place on ungreased baking sheets. Flatten with a fork. Bake 12 minutes or until lightly browned around edges. Cool on baking sheets 1 minute. Remove to wire racks; cool completely. Store in an airtight container. For more delicious and food-related posts (recipes, novels, and more! ), head over to Weekend Cooking, hosted by Beth Fish Reads. In addition to being a year I began earnestly writing my own newspaper column, tearing my way through books and falling in love, something momentous happened: I finally earned an invite to my family’s annual cookie exchange. It’s a ladies-only affair and features the baked goods of my mom, grandmother, aunts and family friends. Until this year, I’d been relegated to the dessert equivalent of the kids’ table: the oldest grandchild on my mom’s side, still a kid. And, you know — that’s okay. But when my grandma finally extended a formal invite to the exchange and let me pick a name for our family’s Secret Santa, another adults-only activity, I was stoked. But that led to some pressure, of course. My Maw Maw, a master baker, recently sent me a hefty stack of recipes — and I’ve enjoyed looking through them all. And in addition to my obsession with several food and recipe sites, my friend Sandy frequently shares her trial-and-error recipes with me. (And I’m totally not complaining.) I was still waiting to find The One, though — that cookie that made me salivate just skimming the ingredients. Plus, it couldn’t be too tough to make. After reading a guest post over at Book Journey, I fell in love with Kim’s family recipe (and tradition!) of Hershey Kiss Cookies. Since I’m still a little skittish about baking and cooking, the simplicity of the directions (and minimal ingredients) appealed to me. And I’m happy to report back that, according to friends and coworkers, they were a success! Your basic ingredients here are flour, chocolate and Hershey Kisses. I’ll say this: I expected that, once in the oven, they would spread . . . much like other cookies do. But when baking, those babies stayed firmly in their original shape. So when you place them on a cookie sheet, make sure each little ball is as pretty as you’d like it to be when serving! After the first (ugly) batch, I learned that lesson the hard way. Also, I used way more than a teaspoon of dough to surround each Kiss . . . I was worried they would scorch if the chocolate was uncovered. I think there’s something to that. Plus, with my oven, each tray took about 17 minutes until finished. Just keep your eye on these little guys and pull them when the bottoms are brown. Simple, delicious and very, very chocolatey, these are great treats to snack on while slurping some milk! And who knows — maybe they’ll be Santa’s new favorite variety. Give them a whirl. Cream together the butter, brown sugar and white sugar. Add vanilla. Add mini morsels. Stir in flour. Take approximately 1 tsp of dough and wrap around 1 kiss. Place on cookie sheet and bake at 375 degrees for 10 to 12 minutes. On maybe our second date, Spencer — that adorable guy I’m always talking about — looked at me hopefully. Now I wouldn’t say I’m always up for an adventure — that makes me sound like an exciting, rugged mountain girl or something, which I decidedly am not — I am always up for eating. Especially when that eating involves dessert. And furthermore? 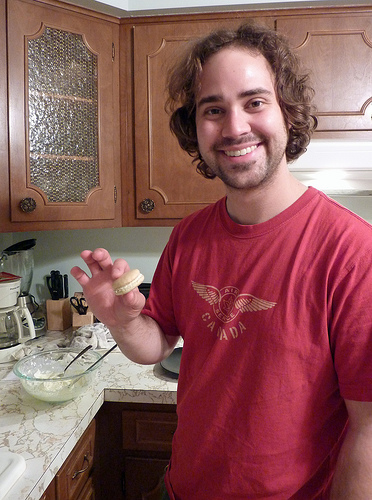 I’m never against doing something that can be photographed, as in the case of the cookies Spencer was describing. And, you know, Spence is cute. I wanted to impress him. After weeks of talking about making the macaroons and not having enough time set aside for the long process, the time came to hunker down and whip up a batch. As Spencer gathered the ingredients from the fridge and cupboard, I held the recipe about an inch from my face, squinting. And, um? Whoa. With an ingredients list a mile long and instructions I felt like I’d need a master’s degree to decipher, dots of worry began to eat away at the lining of my stomach. The very same stomach that desperately wanted cookies. I needn’t have worried, though, considering I have a boyfriend who, in addition to being charming, funny, intelligent and handy (I know, I need to shut up), can cook. Or bake. Or whatever. He can make things. Which is pretty amazing, considering I can’t even manage to not burn an oven pizza. And, when left to my own devices, rely on my good friends at Arby’s or Noodles & Company for dinner. 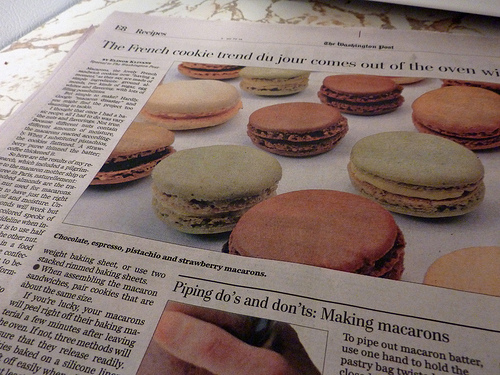 As his sous chef for the macaroon project, my job was to read the recipe, tell him how much of which ingredients to combine and when and to step in to help pipe the batter onto parchment paper when the pastry tip wasn’t cooperating. But the end result? Success! 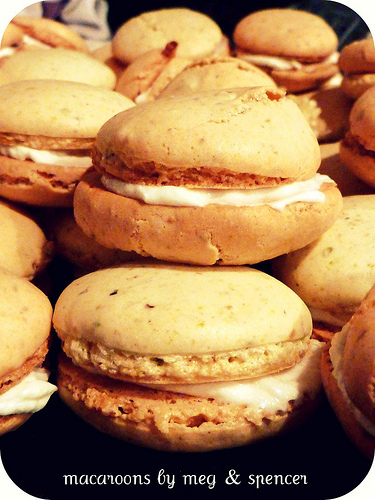 Our pistachio macaroons (or, since these are French, macarons) with lemon filling were adorable and, most importantly, delicious. We didn’t have any green food coloring to give them their familiar hue, but I think they still packed a beautiful punch. And now? I’m sharing them with all of you. Virtually speaking, I mean, because we polished them off about two weeks ago. And I’m already hankering for another batch . . . though this time? With espresso! For the cookies: Preheat the oven to 350 degrees (to allow for a thoroughly heated oven). Line the bottoms of 2 baking sheets with parchment paper or silicone liners. Place the confectioners’ sugar in the bowl of a food processor and process with several short pulses to aerate. Add the almonds and pistachios, and process for about 2 minutes, until the nuts are finely ground, stopping the motor every so often to break up any clumps that form in the bottom of the bowl. Transfer to a large bowl, breaking up any clumps. Beat the egg whites and cream of tartar in the bowl of a stand mixer or hand-held electric mixer on medium-low speed until frothy. Increase the speed to medium-high and beat until soft peaks form; then, still beating, gradually add the granulated sugar. Beat until the egg whites are glossy and voluminous and form stiff peaks. Reduce the speed to low; add the almond extract and the food coloring, and mix just to incorporate. Use a spatula to fold half of the beaten egg whites into the sugar mixture to partially combine and lighten it. Fold in the remaining beaten egg whites until no white streaks remain and they are completely incorporated; do not overmix. Fit a large pastry bag with a 3/8-inch (1-centimeter) plain tip. Spoon the batter into the bag. Holding the pastry bag upright, pipe blobs of batter about 1 inch in diameter, spaced 1 inch apart on the prepared baking sheets; you should be able to fit 36 cookies on each sheet. Let sit uncovered on a flat surface at room temperature for 30 to 60 minutes. The tops will look smooth and lose their shine, and the batter will spread slightly. Bake one sheet at a time on the middle rack for about 12 minutes or until the tops feel firm and crisp when lightly touched. If using a parchment paper liner, allow to cool for a couple of minutes, then peel the cookies from the paper by pressing them off from the underside. 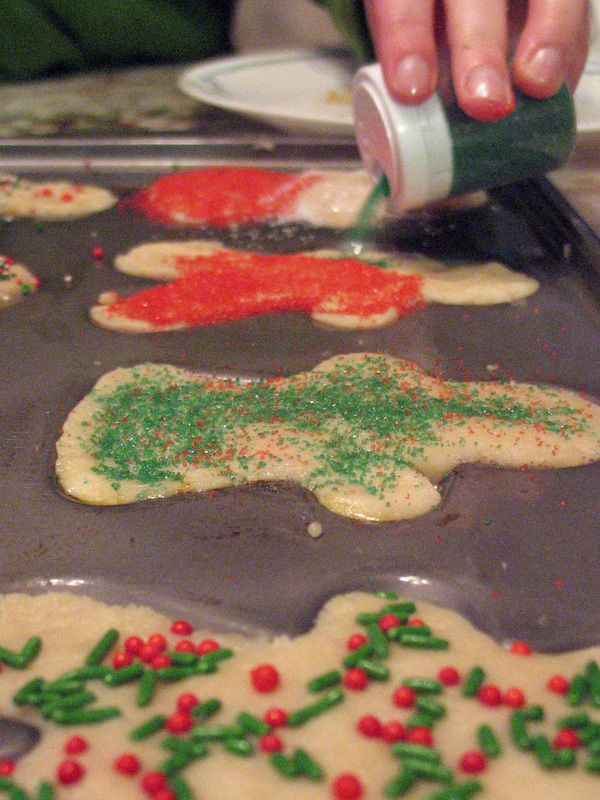 Or, to ensure that the cookies release easily, as soon as you remove the baking sheet from the oven, carefully lift the parchment one end at a time and sprinkle a total of about 2 tablespoons of water under the paper, moving the paper around a little to distribute the moisture more evenly. The steam will loosen the cookie bottoms from the paper. After 3 minutes (and no longer), lift the paper liner from the baking sheet and peel the cookies from the paper. If any of them stick, slide a thin metal spatula under the bottoms to loosen them. If using a silicone liner, let the macarons rest on the lined baking sheet for 10 minutes, then peel off the macarons. Transfer the macarons to a wire rack to cool. Repeat to use all of the batter; you should end up with at least 100 bite-size cookies. Meanwhile, make the filling: Beat the butter, confectioners’ sugar, lemon zest, lemon juice and almond extract in the large bowl of a stand mixer or hand-held electric mixer on medium-low speed until smooth. Mix in the food coloring, if using. When ready to fill, turn half of the cooled macarons bottom side up. Use a small rounded knife to spread about 1 rounded teaspoon of the filling over each cookie bottom, or use the pastry bag and tip to pipe the filling onto the cookies. Press the flat bottoms of the remaining cookies onto the filling to create about 50 small macaron sandwiches. (You may have a little filling left over.) Serve, or cover and store at room temperature or in the refrigerator for up to 3 days. To pipe out macaron batter, use one hand to hold the pastry bag twisted and closed at the top and the other hand to guide the tip. Hold the bag straight up and down, with the tip close to the parchment paper or silicone liner. Use your top hand to squeeze out a round blob of batter 1 inch in diameter. Don’t try to draw a circle at fill it in; the results are more likely to be irregular. You might find it helpful to draw 1-inch circles on the parchment paper as guides; turn the paper over and pipe onto the non-penciled side. You’ll have no trouble seeing the guide lines. 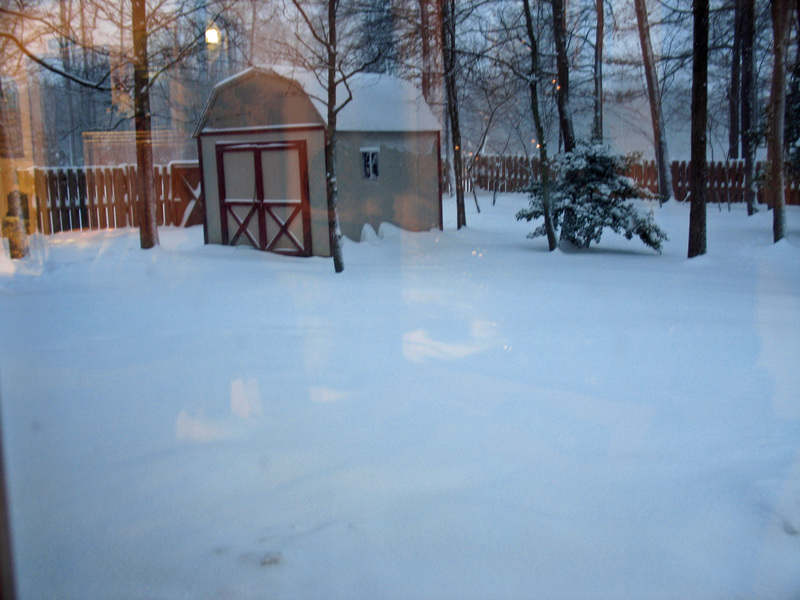 So we’re in the middle of a snowpocalypse here in the Washington, D.C. metro area! 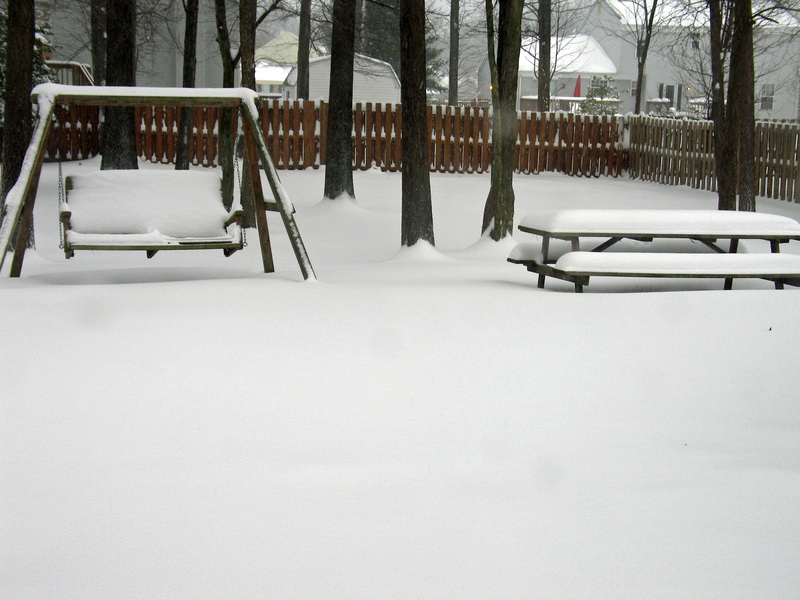 The most snow ever reported in December has covered our area in a thick blanket of white. Of course, the kid in me felt a smidge disappointment when our snow day falls on a Saturday, but the adult in me feels grateful none of us had to try and get to work yesterday! 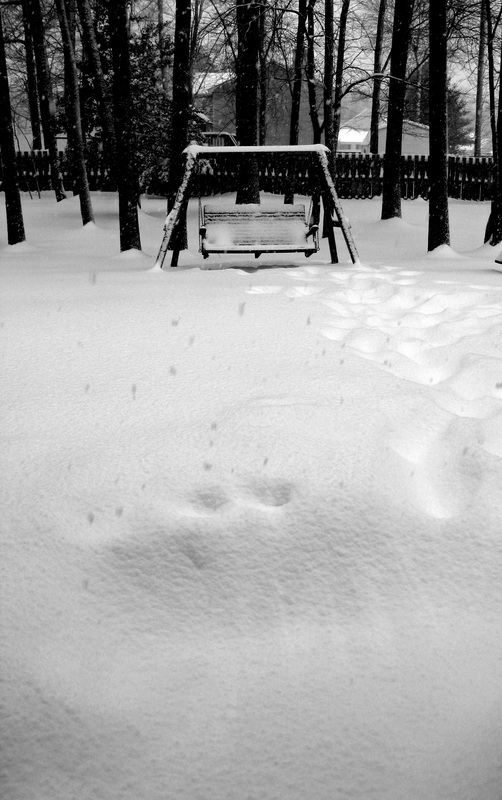 Because, you know, almost two feet of snow? That’ll slow down your progress a bit. Since we definitely weren’t going anywhere yesterday, my family hunkered down to tend to all sorts of Christmas-related activities! And on the top of my list: baking. My sister and I made our annual sugar cookies and they came out quite stunning. And by “stunning,” I mean delicious… because I quickly ate my way through the first batch. But, you know… that’s what they’re there for. Santa won’t mind! 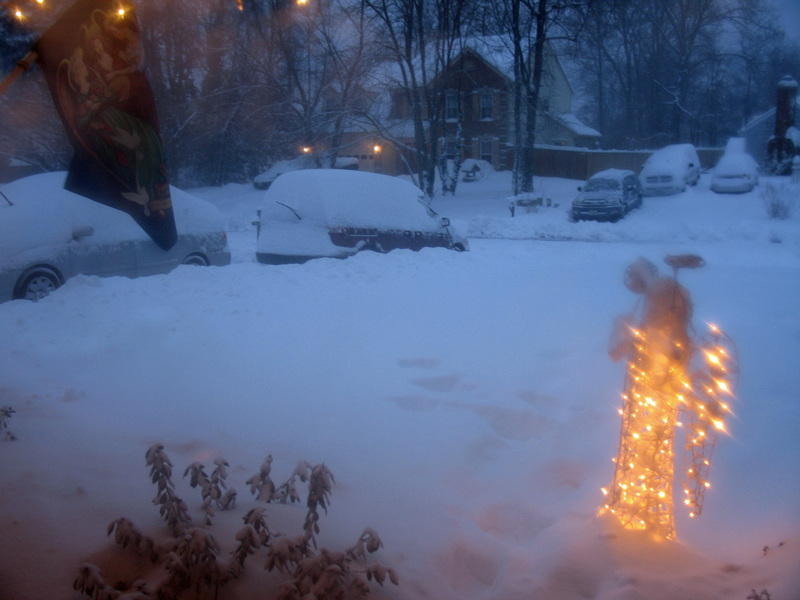 The big part of any snow day, of course, is actually digging out. We’re lucky my dad is such an intrepid believer in tackling the snow as it falls, rather than waiting for all of it to come down before venturing out with a shovel. We went out yesterday and moved as much of it around as we could, but by the time we reached the end of the driveway and turned back — the concrete was covered again. Frustrating! And what’s worse? Muscles I didn’t even know I had in my arms, shoulders and back are screaming at me in the most shrill of voices. I feel like I spent yesterday moving boulders with nothing but my hubris and bare hands.